Excessive Heat Warning—Take Action! An Excessive Heat Warning is issued within 12 hours of the onset of extremely dangerous heat conditions. The general rule of thumb for this Warning is when the maximum heat index temperature is expected to be 105° or higher for at least 2 days and night time air temperatures will not drop below 75°; however, these criteria vary across the country, especially for areas not used to extreme heat conditions. If you don’t take precautions immediately when conditions are extreme, you may become seriously ill or even die. Excessive Heat Watches—Be Prepared! Heat watches are issued when conditions are favorable for an excessive heat event in the next 24 to 72 hours. 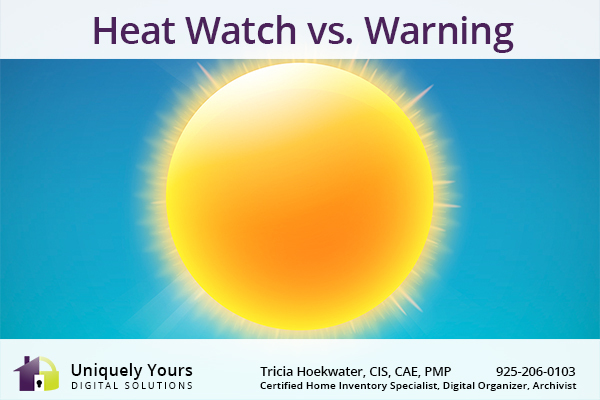 A Watch is used when the risk of a heat wave has increased but its occurrence and timing is still uncertain. Heat Advisory—Take Action! A Heat Advisory is issued within 12 hours of the onset of extremely dangerous heat conditions. The general rule of thumb for this Advisory is when the maximum heat index temperature is expected to be 100° or higher for at least 2 days, and night time air temperatures will not drop below 75°; however, these criteria vary across the country, especially for areas that are not used to dangerous heat conditions. Take precautions to avoid heat illness. If you don’t take precautions, you may become seriously ill or even die. Excessive Heat Outlooks are issued when the potential exists for an excessive heat event in the next 3-7 days. An Outlook provides information to those who need considerable lead-time to prepare for the event. Take care of yourself…and those around you. You should also protect what you have! Get a home inventory today. Contact Tricia via phone at 925-206-0103 or by email uniquelyyours@outlook.com to schedule your inventory today.